Finding the perfect rangefinder is now an easy process. 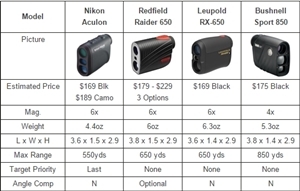 Laser Rangefinder Review has compiled several comparison charts by application so you can quickly and easily compare competing models side by side; then read in depth reviews highlighting the pros and cons of individual models to help you make your final decision. 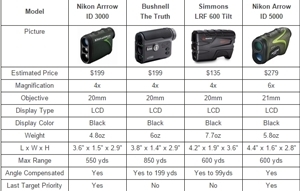 For those of you that have a preferred brand there are also comparsion charts of rangefinders sorted by maker. Also, be sure to check out our updated Sale Page for bargains on popular models. 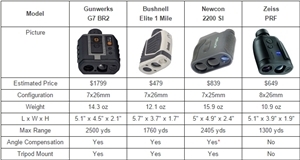 There are a several options to decide on when choosing a laser rangefinder, many that you may not be that familiar with; so we have composed a list of the major choices you will likely face and have given some general advice on each topic. Rangefinders come in one of two basic styles horizontal or vertical. Horizontal designed units are wide and flat and allow the user a steady two handed grip when ranging targets. The solid grip provided by this design makes it a good choice for higher magnification and long distance range finders. The downside of this flat design is that these units are generally pretty bulky when compared to their vertical counterparts. The vertical style is better suited for carry in a pocket or on a belt as they are generally significantly more compact than their horizontal counterparts. The downside of the vertical design is that they can be hard to hold steady and the image can appear to shake and as a result they are generally of a lower magnification than the horizontal design. This is actually kind of a two part question, as currently most laser range finders that feature a black display use a LCD screen, and most units that have a Red screen feature a LED type screen. In a nutshell an LED display is generally thought to offer a clearer view than an LCD screen; however the LCD models are usually less expensive. A black display is generally thought to be easier to see during the bright conditions, while a red display is often thought of as better in low light conditions. However, too bright of red display can obscure the target in low light conditions and too dim of a red reticle can be hard to see in the day, so look for a model whose display is automatically or preferably manually adjustable when choosing a red display rangefinder. 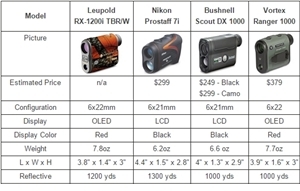 Rangefinders come in magnifications of 4x to 8x, (not counting rangefinder binoculars that can have much higher magnifications) and while applications and personal preference will play a big part in the decision of what magnification will be appropriate for your needs, there are a couple of general guidelines to keep in mind. The higher the magnification the harder it will be to hold the image steady. 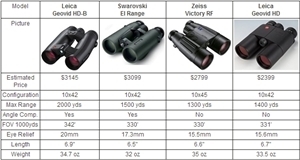 As a guideline 6x magnification probably toward the top end of what most people can hold steady in a vertical style rangefinder, the more stable platform of the horizontal design allows for higher magnifications of 7x or 8x. Also, keep in mind the smaller the target or the longer the distance the more magnification is required for accurate targeting. For example, an archery rangefinder designed for targeting deer size targets at 30 yards would work well with a 4x magnification, while someone shooting prairie dogs at 400 yards would be better served with a 7x or 8 x model. 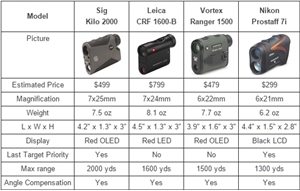 Most but not all laser rangefinders have an adjustable diopter to help focus the unit to your eyes; however, some have more range of adjustment than others, so if your eyes require a lot of correction, i.e. you have a strong prescription look for models with a high adjustment range. Also, if you plan of using the unit with glasses on check to make sure the model your are interested in has a foldable or retractable eyepiece suitable for use with glasses. Just because a rangefinder is listed for 1000 yards doesn’t mean it will range a deer or flagstick at 1000 yards. The maximum yardage listed is usually calculated on a large highly reflective object like a building under ideal conditions. As a quick and rough rule, generally a rangefinder will read a deer at about 1/2 of its maximum rating, and a flagstick at about 1/3 of its maximum. So a rangefinder listed with a 1000 yard maximum range will probably read deer out to about 500 yards, and flag sticks out to 333 yards. Of course this is a rule of thumb and higher end rangefinders will probably read little more than this rule and lower end rangefinders a little less, but it is a good starting point when trying to determine a particular models usefulness for your intended application. These are some common questions that come up when looking at rangefinders, hopefully you were able to pick up a pointer or two to use when searching for a model suitable for your needs. As stated earlier these are some general guidelines and intended to give you a starting point when looking at the different models available. Best of luck in your search and if you have any questions you think we might be able to help you with please don’t hesitate to contact us. The Bushnell CONX is capable of connecting to either a smartphone or certain Bluetooth capable Kestrel, these connections allow this rangefinder to be setup in a variety of ways for long distance hunting and shooting. Sig Sauer is a relative newcomer to the rangefinder world, but immediately started making waves with their Sig Kilo 2000 which has more ranging power than most all rangefinders in its class while not having the premium price tag of some other long distance models.